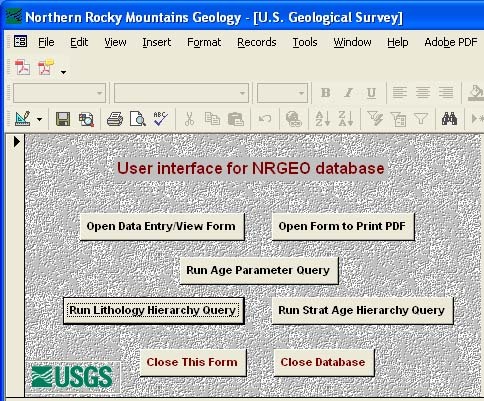 A relational database was created to prepare and organize geologic map-unit and lithologic descriptions for input into a spatial database for the geology of the northern Rocky Mountains, a compilation of forty-three geologic maps for parts of Idaho, Montana, and Washington in U.S. Geological Survey Open File Report 2005-1235. Not all of the information was transferred to and incorporated in the spatial database due to physical file limitations. This report releases that part of the relational database that was completed for that earlier product. In addition to descriptive geologic information for the northern Rocky Mountains region, the relational database contains a substantial bibliography of geologic literature for the area. The relational database nrgeo.mdb (linked below) is available in Microsoft Access version 2000, a proprietary database program. The relational database contains data tables and other tables used to define terms, relationships between the data tables, and hierarchical relationships in the data; forms used to enter data; and queries used to extract data.